This show will air live on Friday, October 31th, 2014 on 100.5 FM CFRO on unceded Coast Salish Territories in Vancouver, B.C. and will also stream live via www.CoOpRadio.org. The podcast of the show will be posted here shortly after airing, so please check back soon! 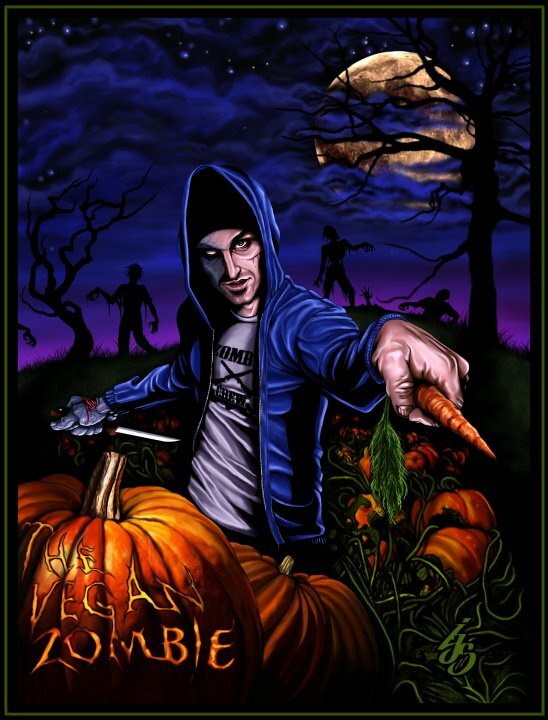 Today’s feature interview is with Chris Cooney and Jon Tedd of The Vegan Zombie. In this episode, we talk to Chris Cooney and Jon Tedd, mastermind and star of the popular Vegan Zombie Youtube Channel, which boasts nearly 60,000 subscribers. Chris explains how he came up with the idea and what his initial goals were when they launched the channel five years ago. As Jon puts it, the “2 month” project he thought he’d signed on for has become so much more, seeing the duo publish their first cookbook/graphic novel combo using Kickstarter and traveling the world spreading the message of veganism in a fun way. This interview is sure to inspire you to take your own passions (Chris’s was making videos, which he taught himself how to do) and put them to work for the animals — you just never know what tricks that turn out to be treats life might have in store for you if you do! In the last quarter of the show, we hear from the Vancouver Humane Society’s Emily Pickett about how to keep companion animals safe from any tricksters out there on Halloween tonight. All the fireworks, trick-or-treaters and even sinister intentions targeting cats, dogs or other non-human animals can put furry friends at risk of flight, fright or injury, so hopefully Pickett’s tips will make Halloween as sweet as can be for boys and ghouls of all kinds. And a reminder that today is the last day of our Fall Membership Drive at Co-Op Radio! Co-Op Radio shows are all hosted by volunteers, and the community station depends on listener support. In order to keep Animal Voices on the air, we depend on listeners like YOU (no, really!) to keep us broadcasting all the local and international animal rights and vegan news, events, interviews and issues you need to stay informed every week. As the only show of its kind in Western Canada, we hope you’ll consider making a donation in our name to Co-Op Radio today to become a member! You can make a one-time donation, or you can become a monthly sustaining member and keep the love coming our way all year round. PLUS! Membership has its perks, including eligibility to win on-air prizes, plus opportunities for training to host your own show! Here’s a Vegan Zombie video of how to make an Egg Trick Muffin, as popularized by Strong Hearts Café in Syracuse, N.Y. Seems like a delicious way to gear up for All Hallow’s Eve (or maybe recover from it the next morning!) if you ask me!